Mindful eating, or offering full awareness to the food on our plates by bringing all five senses to the table, is a skill we can all sharpen. Each and every bite won’t suddenly be elevated to some ethereal experience, but you may find that tuning in, especially to those first couple tastes, changes your eating habits in subtle, yet meaningful ways. Taste memories become stronger, smells and textures richer and ultimately you may feel more satisfied, more filled and fulfilled, with the amount of food your body needs. Mindful eating is a way to connect with yourself, your body, your needs, and your food. Start small: take three deep, conscious breaths (inhale, exhale) before your next meal or snack. Smell your food as your breath in, ground yourself in the moment as you breathe out. Three breaths. It takes no more than 30 seconds. Give it a try. Oh, and this recipe too. Salty olives, bright juicy lemon, bittersweet licorice-y tarragon, and tender artichokes join perfectly cooked, creamy yellow potatoes in this refreshing riff on a picnic staple, best enjoyed with the sun on your face and a breeze in your hair. 1. Place potatoes in a large pot and cover with cold water by 1 inch. Salt water generously. Place pot on stove over high heat and bring to a boil. 2. Meanwhile, in a medium mixing bowl, combine all dressing ingredients. Allow to sit for at least 15 minutes to soften onion and garlic flavors. 3. Check potatoes for doneness every couple of minutes by piercing one with a knife. Potatoes are done when knife slides in, but potato does not fall apart. Air on the side of slightly hard, as they continue to cook after removing from the heat. Drain potatoes and set aside. Prepare remaining ingredients. 4. Once slightly cooled, cut potatoes into 1-inch chunks and peel if desired (my potatoes’ peels were practically sliding off after boiling). Combine still-warm potatoes with the dressing in a large serving bowl. Fold in artichokes, olives, and spinach. Add salt and pepper to taste. Note: This salad tastes best after a little time so the potatoes can take on the flavors of the dressing and the spinach can wilt slightly. A couples hours in the fridge should do the trick. Zesty, peppery, biting - the flavor of a freshly picked radish is anything but tame. For this reason, many people tend to shy away from this surprisingly versatile veggie that also happens to be a nutritional powerhouse. I must admit, radishes hold a very special place in my heart. On the night we were engaged, my husband Brandon and I ate at a farm to table restaurant in Door County, where we had a perfect appetizer of jewel-toned radishes served with smoked sea salt. In celebration of this simple, yet unforgettable dish, we served radishes as a starter at our wedding as well. So yeah, I like radishes. 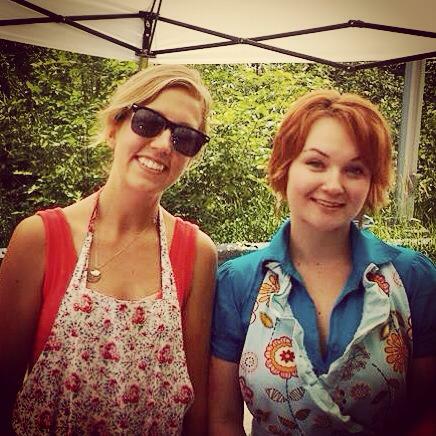 This weekend, my best pal and fellow dietetics student Chetney and I teamed up to do a cooking demonstration at our local farmers market. We shared and handed out samples of two recipes that showcased some of the season's best produce, donated by one of the market vendors, Kettle Rock Farm. Our "Zippy Radish Salad" was a big hit, as was the Kickin' Kale Hummus that'll be popping up on Chetney's blog soon. Under our paper lantern-adorned tent, we prepared this salad from scratch amidst eager market patrons and handed out samples, in response to which many people commented, "I don't like radishes, but this is delicious!" Not only are radishes de-lish, but they're also a good source of vitamin C, fiber, and some pretty amazing phytonutrients called isothiocyanates, which are also found in broccoli, kale, and the other cruciferous veggies we've all come to love. Isothiocyanates (try saying that three times fast) are known to help rid the body of carcinogens and to inhibit the growth of cancer cells by essentially causing them to self destruct. Read more about these fascinating compounds here. But now onto the recipe: the reason this super-simple salad was beloved even by the radish-averse is because it tames the vegetable's bite while allowing just enough of its "zip" to shine through. It's like that one perfect dress that plays up all your nice parts while hiding your less-favorite spots. 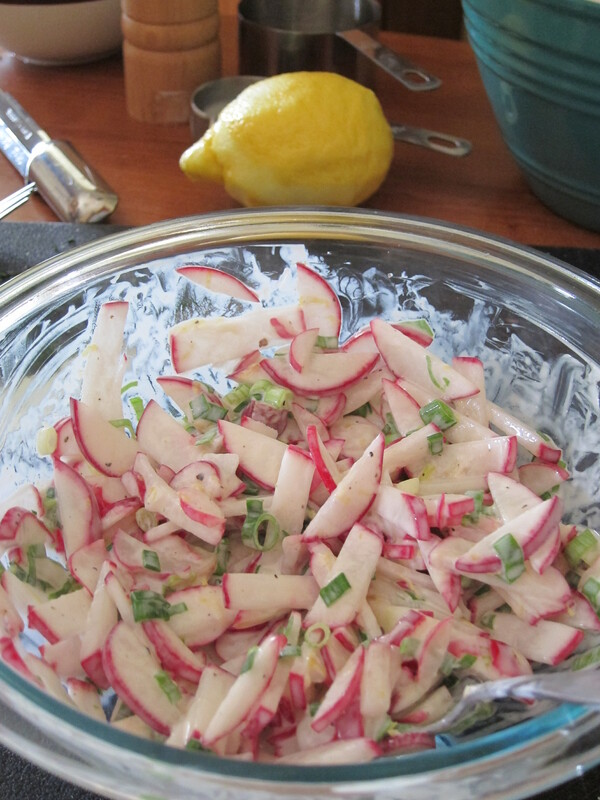 The bulk of the salad is raw chopped radishes and green onions. The "dressing" is plain, whole milk yogurt, salt, pepper, and lemon zest. The creamy, tangy yogurt plays so well against the sharp flavors of onion and radish while lemon zest brightens everything to just the right flavor-hue to please nearly every palate. Enjoy with all your favorite picnic foods this summer, replete with pride in your ability to say "isothiocyanates" with a mouthful of zippy radish salad! Combine chopped radishes and green onions in a medium serving bowl. In a separate bowl, stir together yogurt, lemon zest and pepper in a separate bowl, then pour over vegetables and stir to combine. Just before serving, stir in salt. Note: if you stir in the salt right away and allow the salad to sit before serving, the radishes will lost their crunch and the salad will become watery. 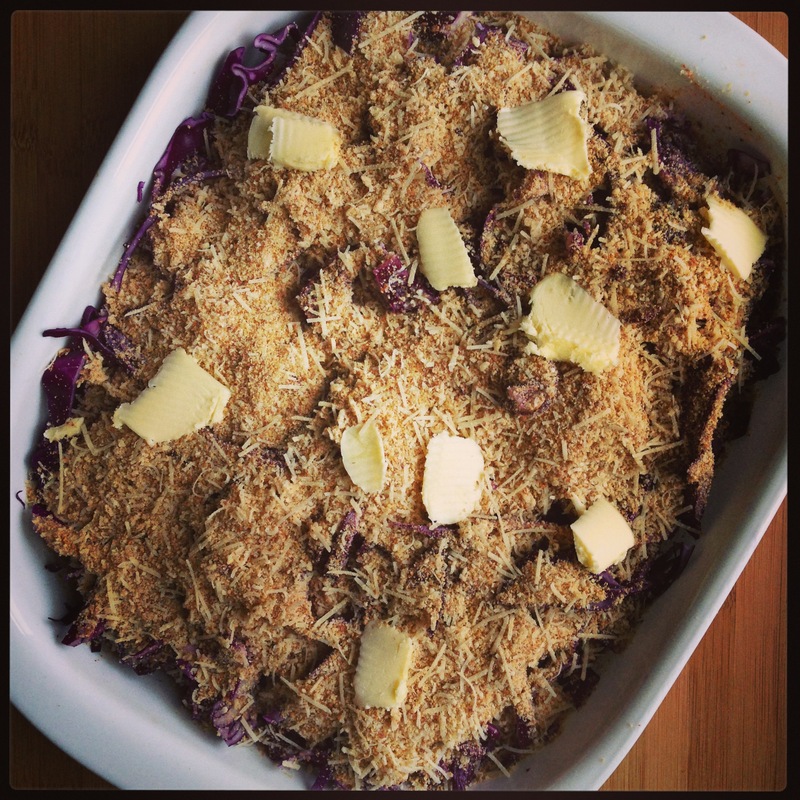 Not long ago, I went on a gratin-pinning spree. If you don’t know what that sentence means, you’re probably reading the wrong blog. Just kidding, mom! 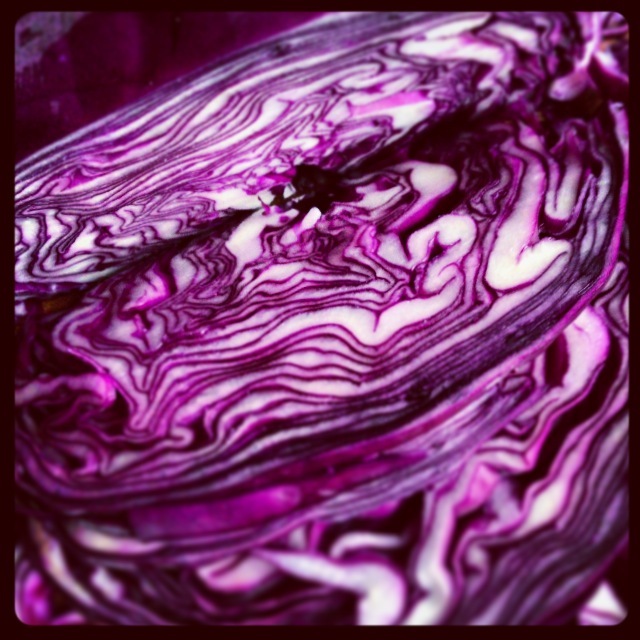 To my Pinterest page of recipes, I added kale and sweet potato gratin, Brussels sprouts gratin, and the beauty I’m featuring today: red cabbage gratin. 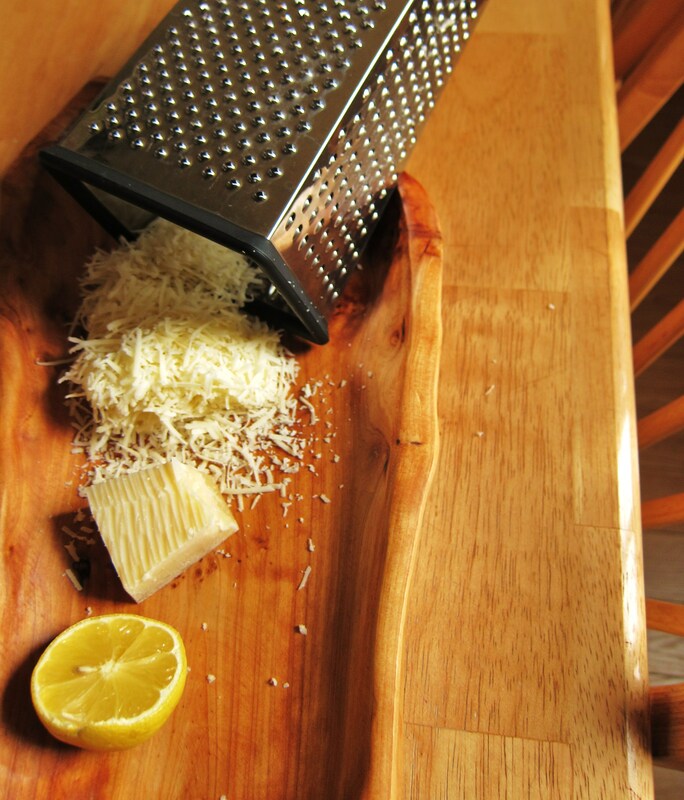 In case you’ve not had the pleasure of knowing a gratin, it’s a food preparation “in which an ingredient is topped with a browned crust, often using breadcrumbs, butter, and grated cheese" (Wikipedia). Random aside: in grade school, the cafeteria served a mysteriously orange offering called "potatoes au gratin." All the kids called it "potatoes o' rotten." 'Nuff said. Any gratin worth making is a vegetable one, in my humble opinion. And this why when I discovered a slideshow featuring just these sorts of dishes over at the Saveur website, I went on the aforementioned pinning spree. At the time I found these recipes, the trees had just begun their wardrobe change and the air was only beginning to resemble a Honeycrisp apple. Now it’s full-fledged comfort food season, and with Thanksgiving right around the corner, there’s nothing more welcome in my oven or my tummy than a casserole dish of cheesy, crispy, gooey vegetables. Lest you be nervous to try a dish starring cooked cabbage, let me just tell you that the flavor of this dish is sublime, thanks no doubt to the Parmesan and breadcrumbs. But even more special is the tender chew and sweet, nutty aroma of the red cabbage after being bathed in paprika-spiked cream for an hour or so. 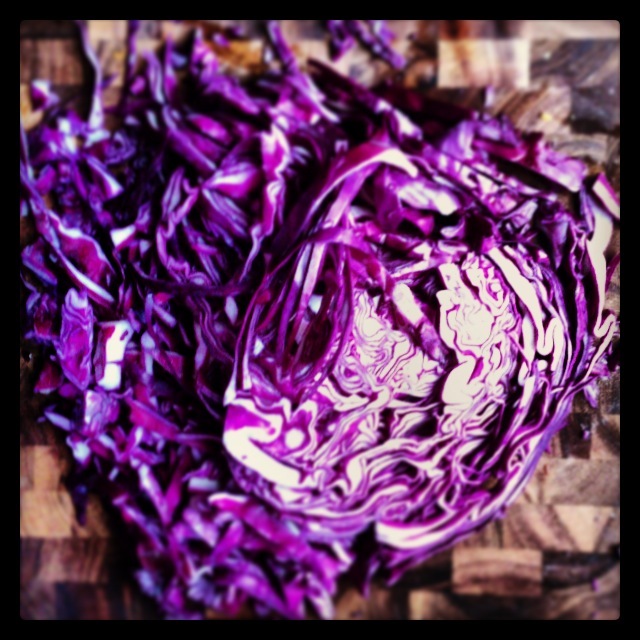 Saveur recommends serving this eye-catching purple beaut' alongside roast pork, turkey, or lamb (perhaps as awesomely out-of-the-box Turkey Day fare), but I think it would stand up just fine as a meal with a green salad and some seedy crusty bread. This is the type of dining I like to do the night after Thanksgiving: something healthy, yet naughty enough to gently ease you off that gluttonous cliff that is the holidays. Cheers! 1. Preheat your oven to 350°F. Grease a 3-quart baking dish with one tablespoon of the butter. 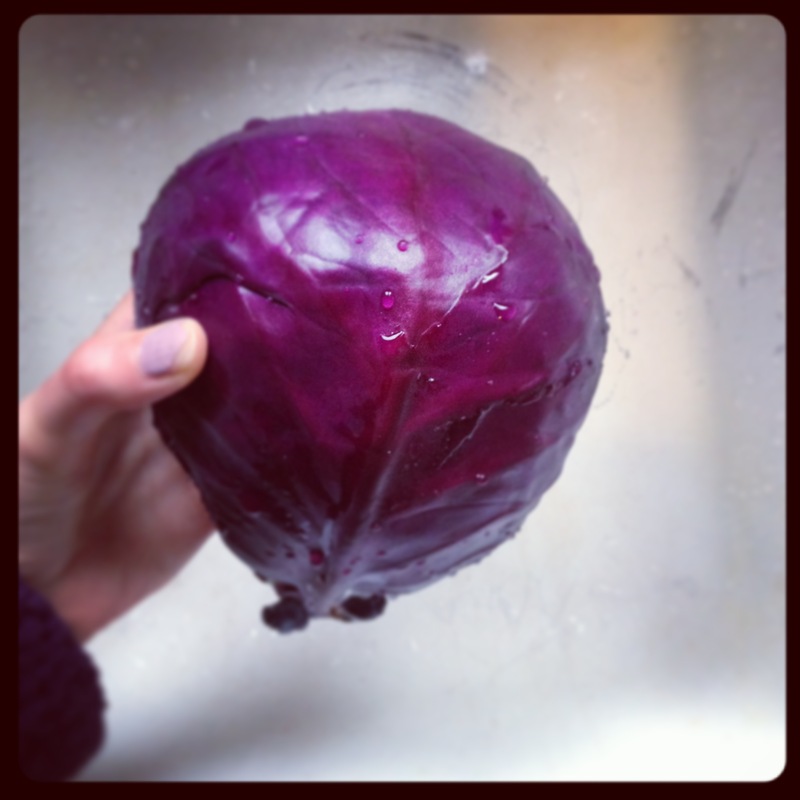 Put the shredded cabbage into the greased pan and set aside. 2. In a 1 quart or larger saucepan, combine the half and half, sweet paprika, sugar, salt and pepper. Heat mixture over medium heat until it just begins to simmer and steam. 3. Pour hot cream mixture over cabbage and stir to distribute evenly. 4. 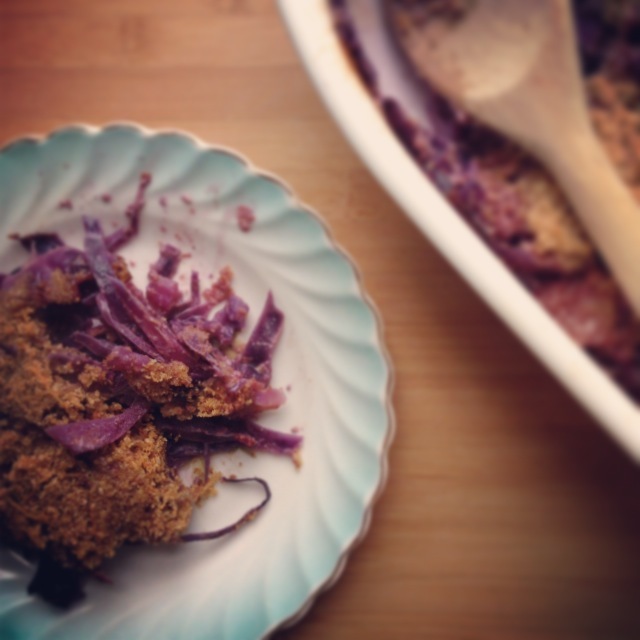 Toss together Parmesan, chopped almonds, and breadcrumbs in a bowl; sprinkle evenly over the creamy cabbage. (It may seem like a lot of topping, but trust me, use all of it.) Dot the top of the gratin with remaining one tablespoon butter. Feel free to drizzle with olive oil if it seems a bit dry. 5. Cover the dish tightly with aluminum foil and bake the gratin until the cabbage is pleasantly tender and most of the half and half is absorbed, around 45 minutes. Then, take off the foil and turn the oven up to 400°F and bake 10-15 minutes more, until the breadcrumb-cheese-nut mixture is thoroughly browned and crispy. Let the gratin cool at least 10 minutes before serving. I wanted to write something profound about how I often miss the way I felt in church as a kid on Easter Sunday. The way the trumpets and lilies and hymns stirred my kid soul and made me joyful. I want to pay homage to those memories, those experiences, but couldn't find exactly the right words to do so. So I will simply offer that as a grown up, I've gladly realized closeness with the divine has no boundaries. We all just have to find our temples. No matter how you choose to celebrate it, Easter can mark a day of renewal, of rebirth. Check in with your New Year’s resolutions. Do some deep-belly breathing before you get out of bed. Let the sun shine on your face for an extra minute or two. See the beauty in being alive today. Make a healthy meal to nourish your body and share it with loved ones to nourish your soul. 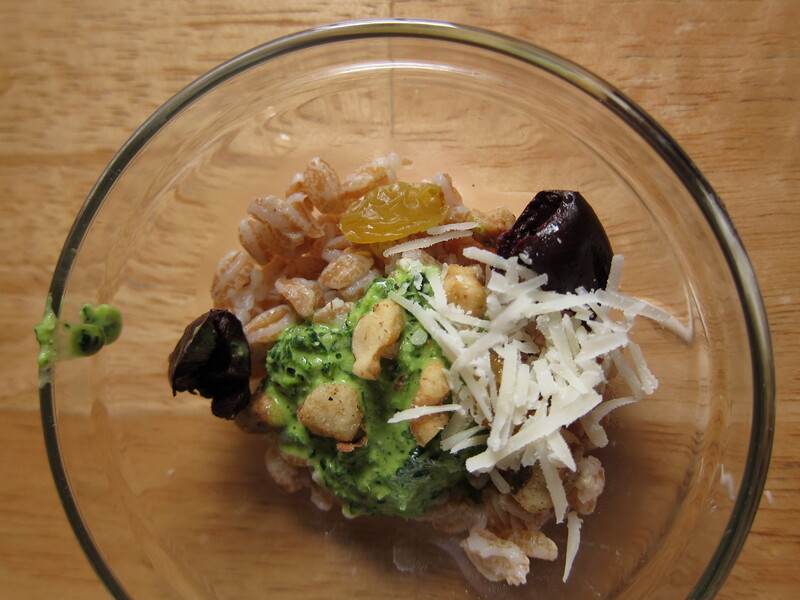 I offer you this pesto recipe which you can whip up and use as the base for a springy salad to bring to tomorrow’s festivities. In this way, you will effectively help counterbalance the salty ham, cheesy potatoes and Cadbury cream eggs. Don't even get me started on Peeps. This pesto is great on lots of things. I used it as the dressing for a cold farro salad studded with golden raisins, currants, toasted walnuts, and chopped roasted red pepper. Try it on your leftover hard-boiled Easter eggs. Stir it generously into penne pasta, or slather it on boiled potatoes and throw in some chopped black olives for a quick, greened-up potato salad. Bring a large (3 quart or bigger) pot of salted water to a rolling boil. Wash your kale. Cut off the thick, lower portion of the stems and discard or save for another use. Roughly chop the leaves. Peel your garlic and drop the cloves into the boiling water. This will take the bad-breath edge off, amazing! 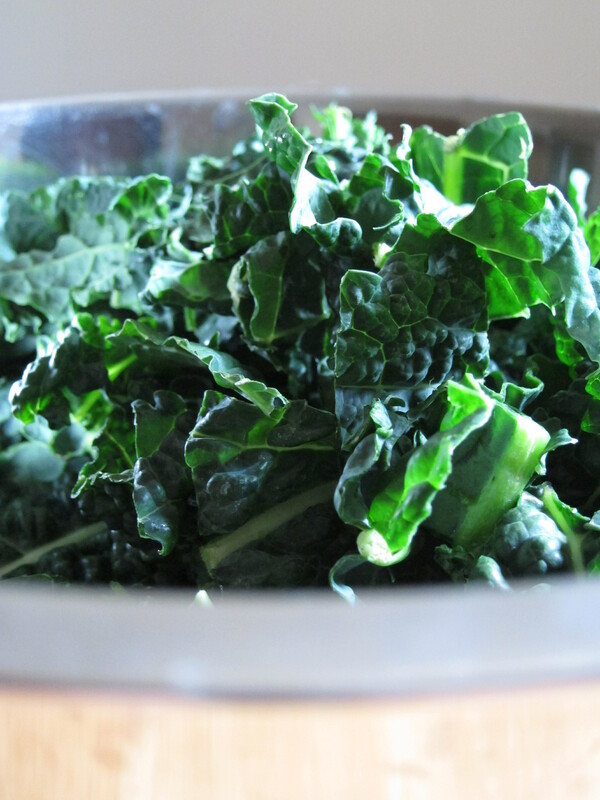 Then throw all the chopped kale into the pot and use a wooden spoon to make sure everyone is dunked under the water. Continue cooking kale for about 30 SECONDS, and then quickly retrieve it along with the garlic cloves using a slotted spoon or strainer and drain well. Save the kale cooking water! 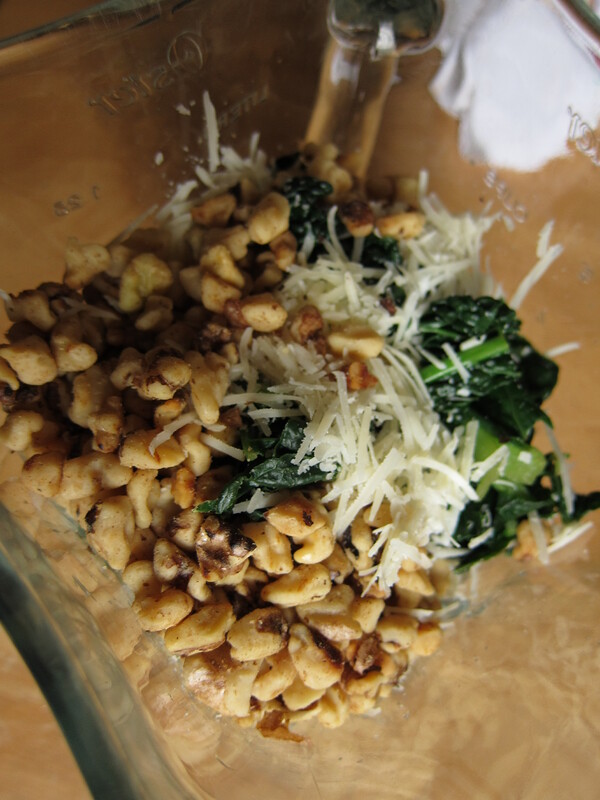 Use a clean dish towel or paper towel to blot the kale dry and then put it all in a blender along with the garlic, grated cheese, walnuts, lemon juice, and olive oil. 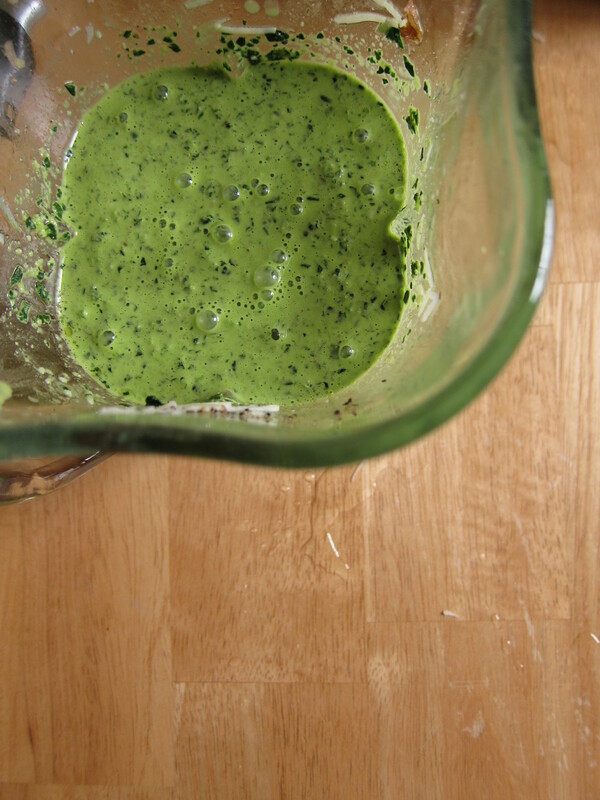 Blend until the consistency resembles a milk shake, adding some of the kale cooking water as needed to move things along. 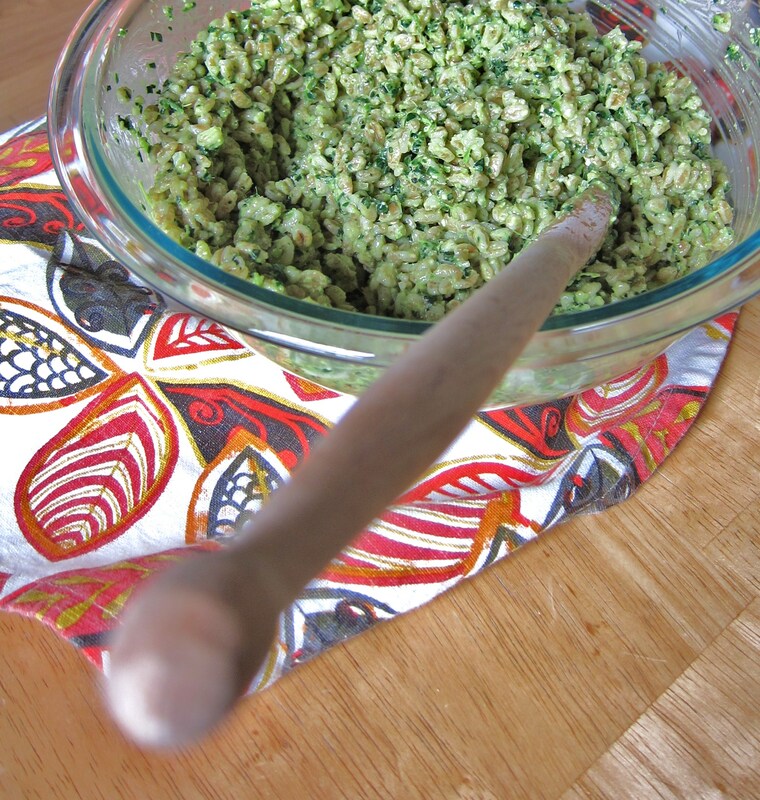 Once you get the desired consistency, taste the pesto and add salt until it tastes just right. Pour your pesto into a jar for later use or directly onto some farro or other hearty grain for a great salad/ side dish for your Easter feast!